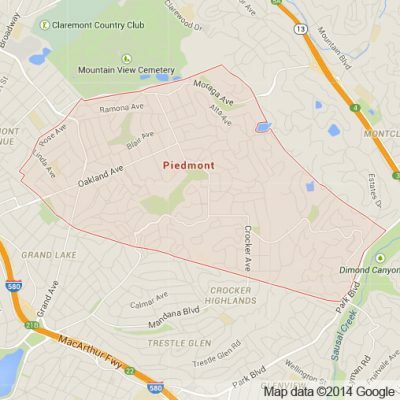 Surrounded by Oakland in the hills is the affluent and gorgeous enclave of Piedmont. Piedmont is desirable real estate in the Bay Area because it boasts incredible views of San Francisco and Oakland and is in close proximity to these cultural epicenters of Northern California. While a small town, Piedmont is home to a number of parks including Dracena Park, Crocker Park and Piedmont Park. These parks add to the suburban and rustic feel that Piedmont has even though it is entirely surrounded by metropolitan Oakland. There are a number of small shops in Piedmont and even more shopping close by in the Oakland Hills. With many notable celebrities in the world of sports, entertainment and politics who have called Piedmont home over the years we are proud to once again be Piedmont’s number luxury transportation service. Here at Apex Limousine Transportation we offer residents and visitors alike a number of limousine and sedan services. For those looking to plan their wedding day, we are the go to service provider for comprehensive wedding day limousine transportation. Our limo vehicles are elegant and perfect for any wedding day no matter the scope or size. We understand the difficulty and complications included in planning an outstanding wedding. For these reasons and more we work directly with the party we are providing for to ensure and double check that everything we are bringing to your wedding day is exactly what you want. For those individuals and businesses working out of Piedmont we offer prompt, timely and always relaxing airport transportation on our new model sedans and SUV’s. We currently offer limousine, SUV or sedan pick up and drop off to any one of the major Bay Area airports – SJC, SFO and OAK. Our professional limo drivers are always on time and consistently ensure that you are on time to which ever airport you need to be at. Apex is also the number one limousine transportation provider in Piedmont offering comprehensive limousine transportation services for junior prom and senior ball to area high school students. We are a consistent favorite among students and parents alike because of our commitment to safety and reliability. For those residents of Piedmont looking for a night out in the city our limo drivers will gladly take you and some friends or just that special someone to the best restaurants and bars in San Francisco leaving you not having to worry about transportation. If you’re looking for something different and little more adventurous we also specialize in Napa Valley Wine Tours. These winery tours are different every time and depend on the taste and specific desires of each party. There are plenty of wineries, restaurants and other destinations to choose from in the Napa Valley and our knowledgeable limo drivers will help customize your adventure with their vast knowledge of the region. Our professionally trained drivers complimented with incredible vehicles make Apex an obvious choice. There is a reason we are the number one limo transportation service in Piedmont. We have a reputation and we are ready to live up to it. So what are you waiting for – get in touch today and tomorrow we can ride in luxury. Please call us for car service all inclusive total for Piedmont to/from Napa Valley transfer.